As the Indian economy suffers under crisis, the government says it is fighting the slowdown with number of measures.Finance Minister, P Chidambaram is of the view that there are many countries with 0% growth rate while India is still maintaining 5-6 % growth and that was great. The Planning Commission Deputy Chairperson, Montek Singh Ahluwalia, said that a GDP growth of 5.7 per cent in FY14 would indicate that the economy is on a rebound. Numbers are numbers. Aren’t they ? If numbers could give all the Indians two meals a day, we would have been the happiest economy.The ground reality is altogether different. You feel the pinch with the rising prices of the day-to-day things you buy while the earnings remain stuck at what it were an year back . Now is that true? Well! Well! Asal me nai toh nakal hi sahi! Other countries the government bear the burden of any crisis and ensure people are taken care of, they wont mind the growth index suffer for few years. Here our lord politician bagwans put the burden on the people and ensure the numbers & Their personal bank balances are taken care of, They wont mind the people suffer for few years. Happy the people, better their contribution. You exploit them, they will retaliate with selfish attitude, they never care for the nation which does not care for them. Bad-Politician Rascals played major part in isolating patriotism from Indians. Young generation will throw them out. That future is not far. Exactly bro, Gross National Happiness could be a solution but that concept just emerging.. Even I believe in Educating, nothing gives hope than that. Reblogged this on Propel Steps. Agree….on papers anything is possible if you have the skills and we have a very skillful govt! There’s the missing link between mathematics & ground reality !! 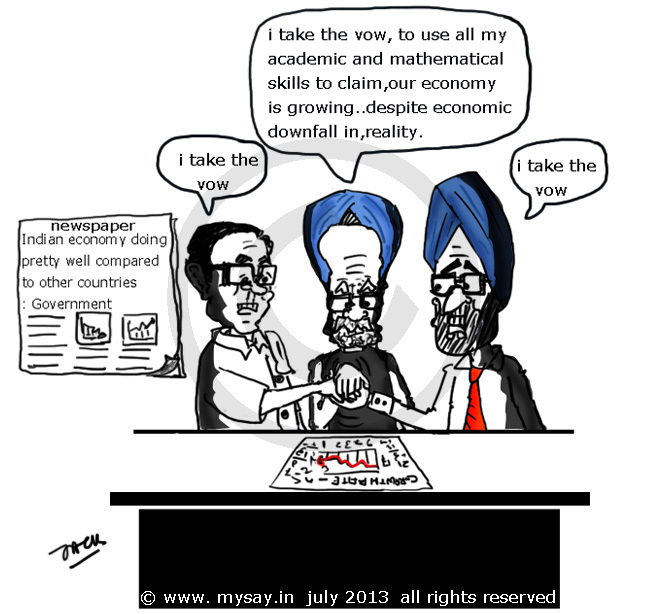 Economics students should be made to study Social Science to make them realize the futility of their GDP calculation !! true that !! recall Montek Singh’s calculation of some rs 32 earning Indian can earn his meal two times was the result of such economics of numbers . why do they state such things even after we are facing the heat of falling rupee and basic things going costlier, is a question worth analyzing!! It looks good on paper. Hope for the masses, yet as you said channeling that into something real is quite tough!! Love this one. Brilliantly portrayed! I loved your creativity. The message conveyed is great… It is an obvious fact that the Government’s figurative data like GDP are all trash.. reality depicts a worsening economic situation in India… all except the likes of India’s PM, Fin Ministry are aware of the real situation! As your doodle states… think tank heads think they can make people forget reality by stating all sorts of fancy figures… How can people believe it when rising costs and worsening money situations are glaring in their daily life?